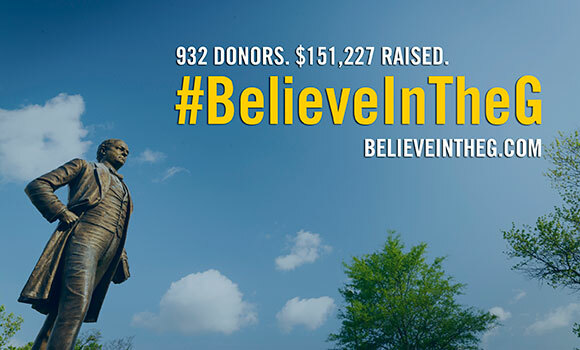 More than 930 donors and $150,000 later, it’s clear that Spartans #BelieveInTheG. For the third straight year, UNCG’s annual #BelieveInTheG giving campaign was a huge success, with this year’s event on Feb. 16 and 17 seeing a 54 percent increase in participants and a 20 increase in dollars raised. The $151,227 raised includes $85,000 in gifts from generous “challenge donors,” whose gifts were unlocked as the campaign met its participation and social media goals over the course of the two days. Additionally, Spartans nationwide showed their support on social media by using the hashtag #BelieveInTheG to share their UNCG stories. Check out some of the highlights in the Storify post below, and visit BelieveInTheG.com to learn more about the campaign.